We’re coming up on one of my favorite excuses to consume excessive amounts of margaritas and Mexican food, Cinco de Mayo! 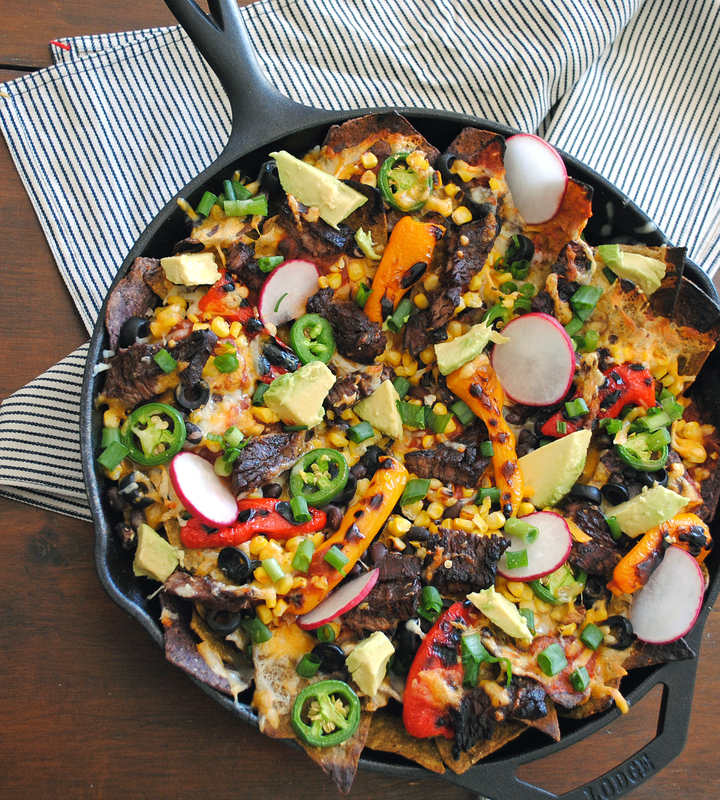 To get in the holiday spirit I decided to play around with some nacho recipes (It’s a tough job people, but someone has to do it!). 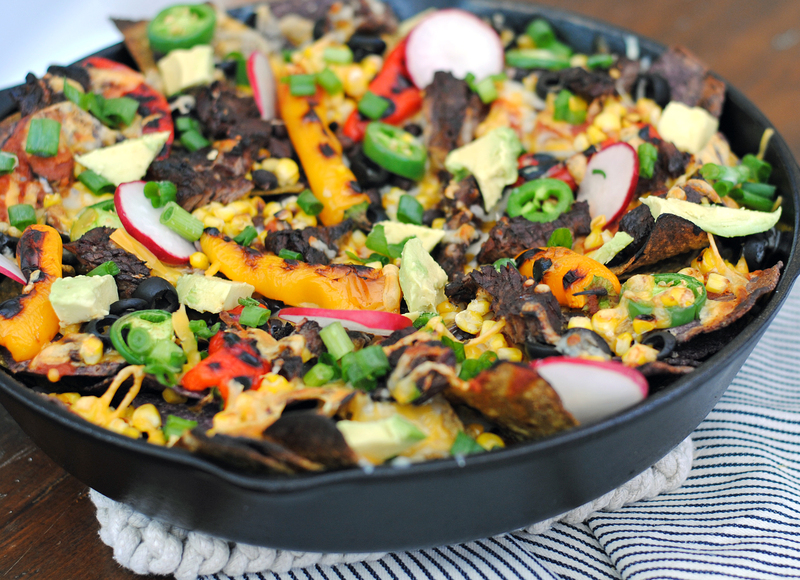 I really like the idea of nachos being a full meal, because I usually feel just full enough after eating them that I don’t really want an entree (but then I’m like, did I really just eat a bowl of cheesy chips for dinner?). My solution: add the full meal to the bowl of chips! I stepped out to our new grill (my current favorite toy) and grilled up some skirt steak, corn, and baby peppers. 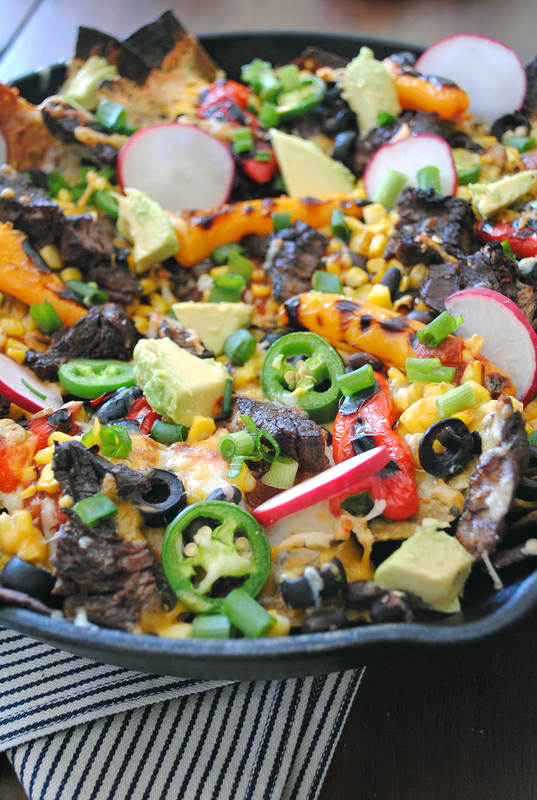 All of that grilled flavor adds such a great element to the nachos, and you get your protein and veggies in! I assembled everything in a cast iron skillet — you could certainly make these on a baking sheet, but I like that you can really layer the toppings and cheese. Once you pull the top chips off, you have a cavernous new layer of nachos to explore (literally there is nothing more upsetting to me than finding that someone didn’t layer cheese deep enough in the nachos — blasphemy I tell you!). I chose two types of chips, Food Should Taste Good Blue Corn Chips and Guacamole Chips for their flavor, color, and of course sturdiness (gotta hold up those toppings!). 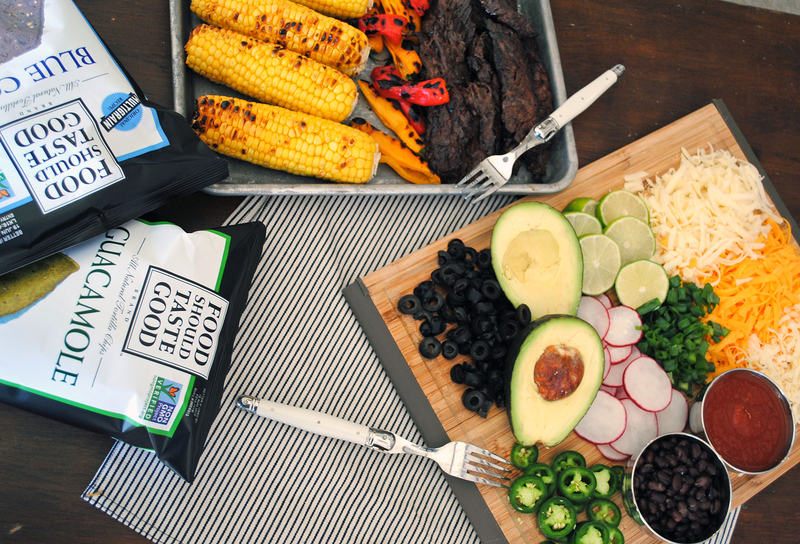 The blue corn chips are little bit sweet, and the guacamole chips have just a dash of spice — they work well together and I love that the two colors pop under all of the cheese. With all the toppings layered in, you just need some heat — either back on the grill or under the broiler — to get that cheese melty and meld everything together. I like to save some fresh crispy toppings for the very end: scallions, radishes, avocado and some lime juice. These nachos? They’re magic. I swear they disappeared right before my eyes! Preheat grill to medium heat, and season skirt steak with salt and pepper. 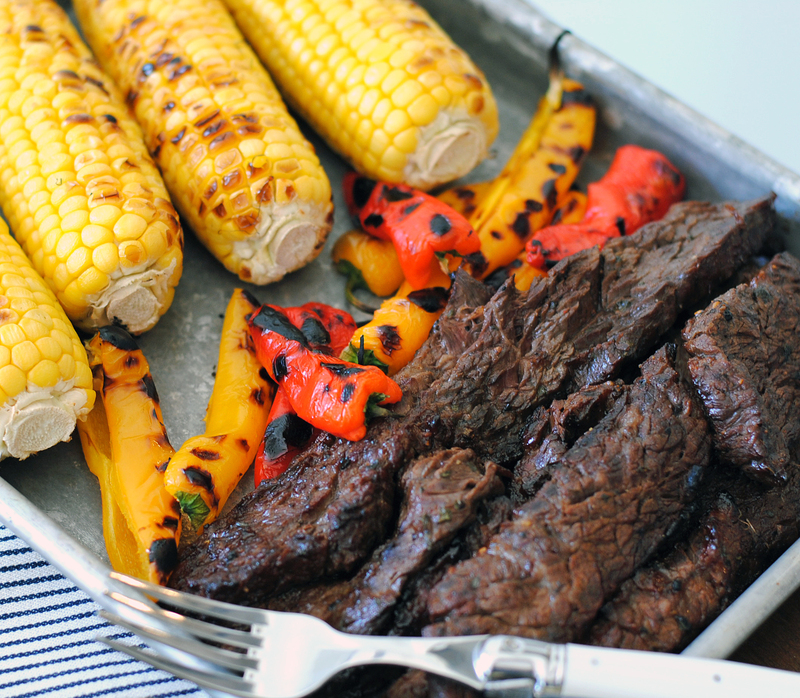 Grill steak until cooked to desired wellness, and grill corn and peppers until they start to char. 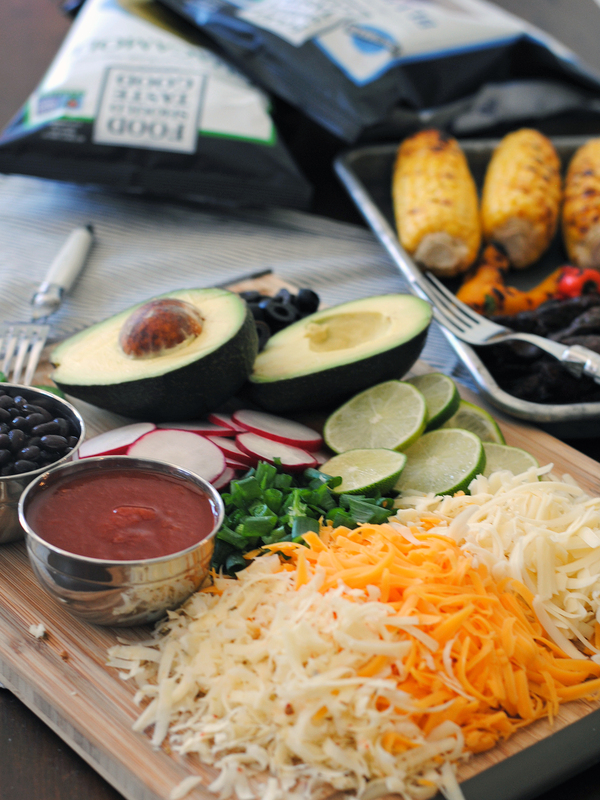 Remove all items from heat; chop steak and cut the corn off the cobs, slice peppers in half. 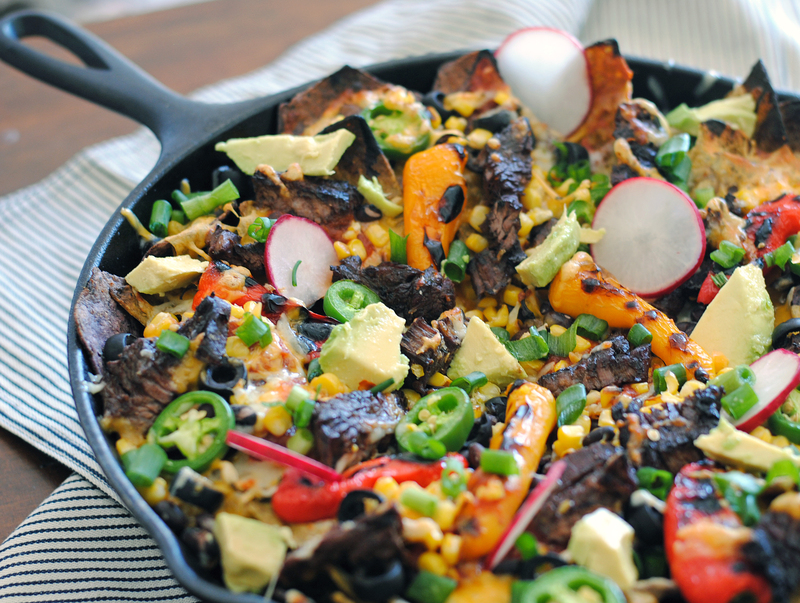 In a large cast iron skillet, layer tortilla chips (Blue Corn and Guacamole chips used here) with shredded cheddar cheese, jalapeños, black olives, salsa, grilled steak, corn, peppers. Continue to layer until the skillet is full and add remaining toppings to the top layer. At this point you may either put the skillet back on the grill (closed) with high heat for about 5 minutes, or under the broiler in your oven for 1-3 minutes. Watch carefully to avoid burning. Before serving, toss chopped scallions, radishes, and avocado on top and squeeze the juice of a fresh lime over the top! Sweet Corn and Rainbow Chard Stuffed Shells. Make It Better with Martha Stewart Living.